Painting commissions is always a fun challenge. Instead of finding a subject that resonates with me I must work with the client's choice. I need to arrange and install elements that will result in a pleasing painting while considering and respecting the wishes of the person paying for the exercise. In this case a lady commissioned a surprise gift for her husband based on the little beach house below. They live overseas now and this cottage is full of good memories for them, summertime holidays and the place where they were engaged. My first word thoughts were colourful and fun. I know what this area, Skaha Lake, is like in the hot and active summertime but my first impressions were made on a grey, dreary and freaking cold winters day. I normally would set up on site and begin roughing in some paint but in this case no one was home and without permission I didn't feel comfortable setting up on private land. Also there was a big dog dish and a hefty chain augered into the house. So I took a few photos and did some quick thumbnail sketches, then headed to the comforts of my studio to begin. We had decided on a 16X20" canvas as the clients will be moving around the world for a number of years and this scale won't be any problem to pack for air travel. The house siding was originally pink but is pretty faded now. I decided to amp up the hue and also wanted lots of bright greens to compliment the little house. The background was painted very transparently and I knocked the trees' colours down to help them step back into space. Impossible to see in this low res image but I have placed little touches of green and grey in the pink siding. Also I painted in some uneven texture. These acts will create a much more interesting and vibrant surface than if I had painted it evenly and flatly. I love using paint to create some ambiguity. This is important. IF EVERYTHING IN YOUR PAINTING IS TAKEN TO A HIGHLY RESOLVED FINISH IT WILL BE LIFELESS AND FLAT. You want to see some new things in your painting each time you view it . Without ambiguity there will be no poetry, only craftmanship. Without ambiguity you restrict the viewers' imagination. Okay, off of my soapbox and back to the painting. Under the cantilevered roof and to a lesser degree in the shaded parts of the fencing I installed greens and yellows which are bouncing off of the electric green lawn. Of course in mid summer this lawn is probably clinging to life if not burnt and trampled to death........ but green is happier. I pushed the lake up the beach towards the cottage and then decided to play up the reflections in the windows to suggest people swimming, tubing and generally enjoying the hot Okanagan environment. I set up one of our beach loungers in my studio, then created a little foreground story. I'm imagining that our couple have just stepped away from their chairs and have entered the water. The grass areas are gradated as they recede and my paint is applied more thickly as I approach the foreground. While working to create an interesting picture I attempted to stay true to my original concepts, colourful and fun. When my client "teared up" on her first viewing I breathed a sigh of relief and signed it. 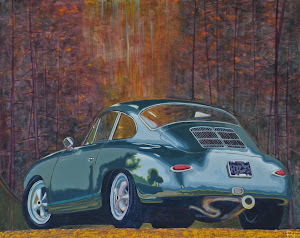 Commissions can be a challenge but one of their great advantages is that the client has a built-in personal connection to the subject already so if we painters do a reasonable job their imaginations will do the rest. I am continuing with my portrait project. Here are a couple of recent sitters, Brad and Lynda. I'm making a huge change , going from a horizontal to a vertical format. I know, pretty terrifying stuff. Seriously though, this is going to give me plenty of new problems and opportunities in my compositions. I look forward to painting hands! Great fun! Also, next month I'll be showing at the LittleStraw Winery in West Kelowna. I'll post an invite next week. 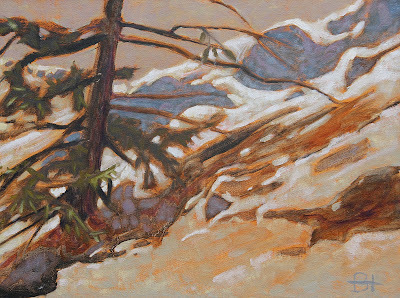 This is a phenomenon that is well known amongst outdoor painters but if you are just starting out it is another tool you can use to create effective landscapes. If you are not a painter then this is trivia. Interesting though, when you look around and see it happening everywhere. Wherever there is a cluster of branches, wires, sailing boat masts or what have you grouped closely together they will obscure the sky that you are observing through them, effectively darkening it a level or two. Our minds know that the clouds behind this tree that I photographed in my yard this morning is the same overall value. Interesting that our eyes read the small sky holes as a lower value. To create a believable sky I will grey down the smaller sky holes, the smaller the hole , the darker the value. Here's the painting of an Amaryllis that I did last week. Blossoms are fun to paint and I can see why painters like to do huge canvases filled with giant blossoms. I'll be involved in a show at the Little Straw Winery in West Kelowna this April. I'll keepyou posted as the date approaches. I'm rounding the half way point in my portrait project now. My objective has been to learn about painting people in the process of working through 100 portraits in a year. I've imposed on myself parameters in order to keep the pieces consistent and the trajectory even. Like any endeavor, the more you work at it the faster you become. The temptation, for myself, is to pull out ever smaller tools and pursue detail. For my work that will be fatal. Ultimately I want the piece to carry the strength that considered and expressive visible brushwork achieves. Too much rendering of detail denies mystery and poetry. I'm choosing to put more energy into the design of each painting. I will be disciplined in time management and stay within my arbitrary guidelines for the sake of the series. You readers and sitters can hold me accountable. Connie D. , below, tried on a few scarves of various colours knotted differently. I decided to keep the colour subdued and I pulled the fabric (in my mind) off to the left. I think the result is pleasing and has a comfortable but slightly unbalanced flow. This week I am working on a commissioned floral painting. I have to work from a photo I took of a brief blooming. 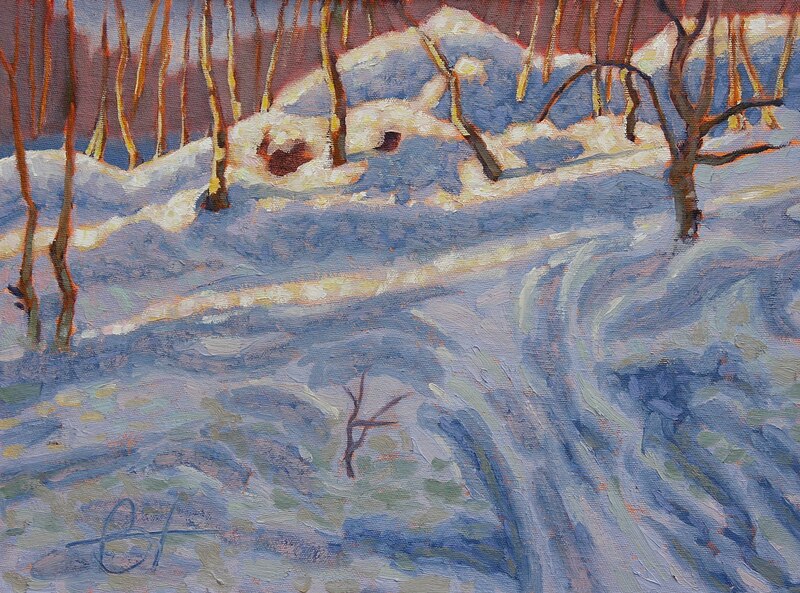 It is certainly a departure from my portraits and landscapes. I will share the result with you however it may turn out. There is a real joy in the painting life. You have opportunity to enter a place, rest within it and respond however it directs you. The longer you spend engaged with your senses attuned to nature the more she offers up. This scene is about the ambiant heat of an Okanagan day. It's about the pine with their lower branches blackened from summer fires and it's about the soft needle blanketed ground. It's about dust obscured atmosphere, heavy with heat. 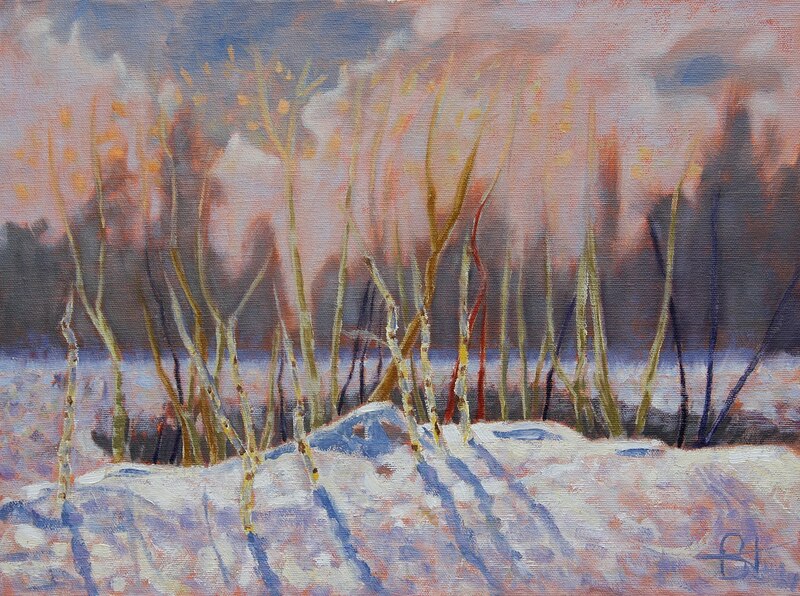 This is the lure of landscape painting, particularly solitary work in the wild. It's a kind of meditation with the divine. It resets your perspective on your place within nature and before your Creator. I started this painting last summer high in the hills above our lake. It sat in my studio until this winter. I rearranged the composition for a pleasing visit to a familiar place. Here's a couple of portraits similar in feeling but technically quite divergent. Clair, the fellow with a ball cap on was approached with a brush fully loaded while Tim, in the lower painting was painted quite thinly. I enjoy the freedom to attack a particular piece using whatever method seems appropriate. I prepped Tim's canvas with a blue ground for a change. It gave me the opportunity to scrape paint off in the reflected light in the shadows for a pretty convincing look. There is always colourful lights hiding in the shadows. Your camera won't record them but spend some time looking and you will be impressed by the opportunities to create exciting passages in your shadows. 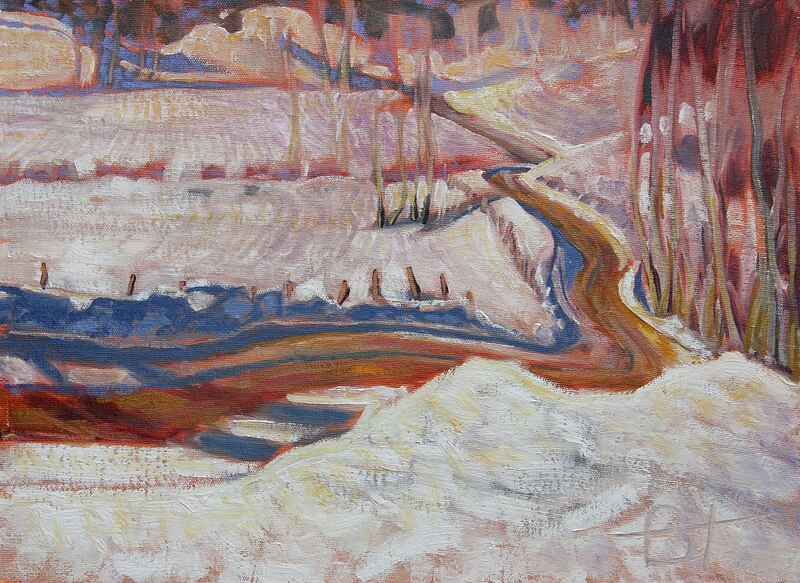 I will share a large landscape I have just completed in my next post. Until then.. There can be some anguish these days amongst us painters as we try to balance our creative work with the need to pay life's relentless invoices. For myself the lack of sales activity pushes me to examine what is important in life and then to jettison the superfluous and focus on the essentials. I like old Solomon's observation after much soul searching; "A man can do nothing better than to eat and drink and find satisfaction in his work. This too, I see, is from the hand of God." Better to dive deep into the work rather than be blown about in a world obsessed with the clever and the trendy. Funny that for all my worry about making ends meet I haven't missed a meal since I was about nine years old. My time is divided between portraits and landscapes so here are a few current examples. You may remember this scene. I painted from the same spot about three weeks before this one. The first snow had fallen between sessions and a good view is a good view. This lovely young girl/woman is Sarah, another of my portrait project sitters. I asked her to pull up her hoodie which effectively transformed the composition . She has a kind of Madonna (saint not pop star) thing going on now. I used pinks and greens to model her face rather than obvious value shifts. In deference to her parents I refrained from including a halo. I like the result and it was fun to do. This original sod roofed house is on a local orchard; co-incidentally our family lived on this farm for a few years when the children were small and the earth was cooling. This image is a bit too yellow because of my photography but gives you a sense of it. The building is surely over 100 years old . Simpler times. Do you suppose the inhabitants had the luxury of worrying about how to sell their art? More likely they were kept busy providing themselves with food and drink. I appreciate how blessed I am to be able to pursue my painting. Back to it. Until next time. My best wishes to you this Christmas. I hope you will enjoy the new life that is at the heart of the season. I thought I'd resurrect a few pictures from my archives that represent this time of year. In doing so I was impressed by the connection I have with these little landscapes. The empathy I have for these exemplifies an importance of painting from life. Most painters that I know work from photos in the comfort and control of their studios. I do the same for some of my work, virtually all of the larger projects. So why do plein-air painters rant on about the value of working from life? I'll use water-skiing for a comparison. You can watch others skiing on TV or play with a skiing simulator on your Playstation until you max out the levels. It's not until you get on the water behind your crazy brother-in-law's boat, crash a few times and experience some real surface-tension at speed and then finally drink in the exhilaration of speed, spray and two-cycle fumes that you have skied. When you get off the water to play on the simulator you surely will be even better than before but more importantly you will have experienced the sight, sound, smells and feeling of skiing. When I look at each of these paintings I return to the exact spot where I stood before nature and grappled with the subject, trying to engage and express something true and real. I can even remember the smells and the warmth of sun and the chill of winter breezes as I leaned into a drifted hillside or sheltered beneath snow laden trees. I'm enriched by the encounters I had with deer, coyotes, fox and moose in this outdoor work. Below is a larger studio piece that was based on a photo and executed indoors. You can see that I had time to explore with technique and being larger in scale I could also develop my ideas further than in my plein air work. I utilized some of my lessons learned from my outdoor observation. I am very happy with the result. The difference for me is that I could never find this little tree. I know exactly where all these others live. It's about spending time with them, engaged in observation. So if you've never tried painting from life, go for it and you will see where the addiction begins. Enough of that. Take a few minutes to watch this heart warming video. It demonstrates what this thing called "art" is about. Check out Video Bar at bottom of page. 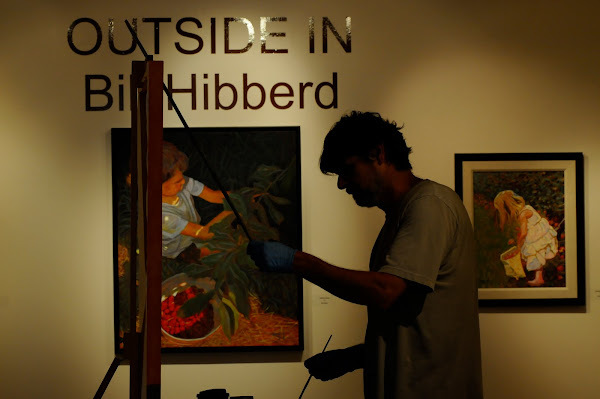 WL (Bill) Hibberd’s landscapes and figurative paintings are an expression of his search for beauty and truth in our world. 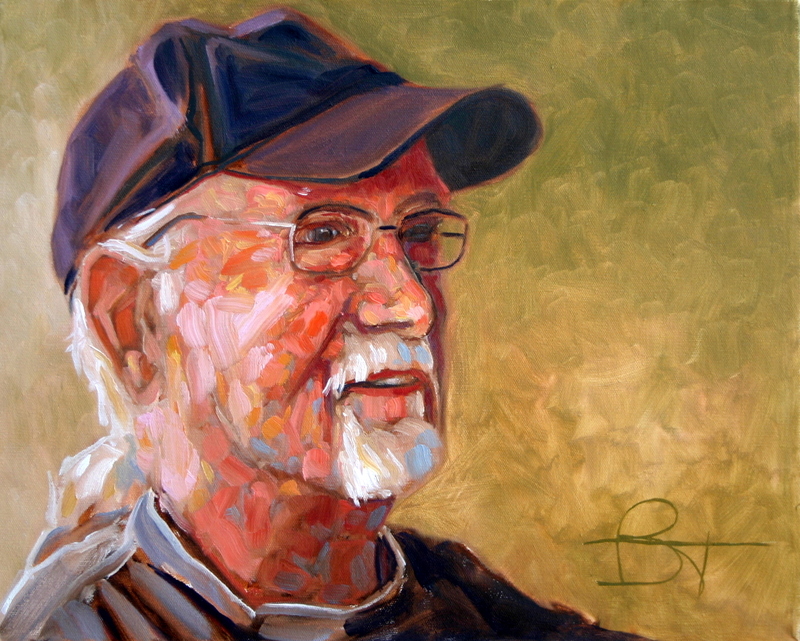 Bill stands on the shoulders of the great painters from the past and strives to build on a historical foundation to create his own unique visual language. Painting in oils, primarily from life and often outdoors Bill discovers beauty in people and the landscape from which he attempts to compose pictures that inspire contemplation of the glory and wonder of creation. 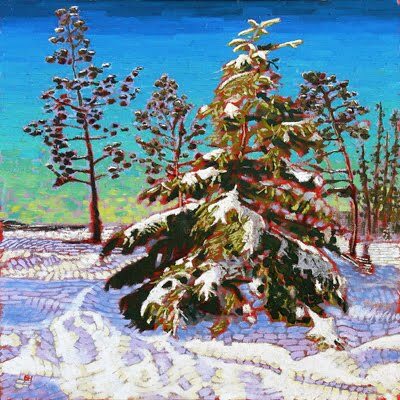 You can follow Bill’s artistic journey on his regular posts at www.billhibberd.blogspot.com His work can be found in numerous collections and recent paintings are available through www.tumbleweedgallery.ca or Sleeping Giant Vineyards in Summerland, B.C.